You’ve done it. You’ve made the purchase of a lifetime and brought a beautiful piano into your home. However, before you begin to play there is one more accessory that you need to purchase. By that I mean, you will need to do some due diligence and select a piano stool. Shopping for an antique piano stool via the Internet can be a very difficult process. You can typically find the best prices online for this type of purchase, but you obviously miss out on one of the more important parts of the process —actually sitting on a piano stool. When you sit on a piano stool you can test it for a variety of factors. For instance, how comfortable it is, if it seems sturdy if the color choices/style fit your home décor, if there is storage to hold your sheet music/music accessories, and if there are small protectors on the legs to protect the floors of your home. However, the five antique piano stools below are all great options if you decide to go the online route. This is a beautiful and elegant antique piano stool from CPS Imports that feels like the most “antique” of the options on our list. The leather and wood look high quality and expensive. The price is higher than many other options at $179.99, but if you want the most luxurious antique piano stool out there, then this seems well worth it. The cushion is made out of 100% genuine leather and has a deep diamond tufted seat with 10 buttons. The frame, legs, and side pieces are made of solid walnut-colored hardwood. 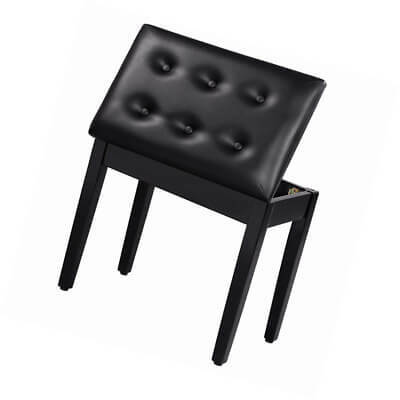 The stool is 24.5″ long and 14″ deep, and most importantly, is adjustable from 19” to 21”. The stool weighs 26 pounds and comes with a 1-year warranty. The one drawback with this piece is that there doesn’t seem to be built in music storage which could be a deal breaker for many. All the other options on our list have built-in storage, and this is usually what consumers tend to prefer when selecting a piano stool. More budget-conscious shoppers will probably respond well to TKT-29’s entry on our list. This is a more simple design for an antique piano stool but seems to do the job quite well. It has a beautiful glossy black finish and there is a built-in space for music storage. This storage space makes this a great option for anyone who likes to keep a lot of music near their piano at all times but does not have a lot of shelving space available. The stool can hold up to a whopping 300 pounds, so clearly is very sturdy. The dimensions are: 29 1/2”L x 13 3/4”W x 19 1/2″H. The price of $90 is reasonable compared to other high-end models. 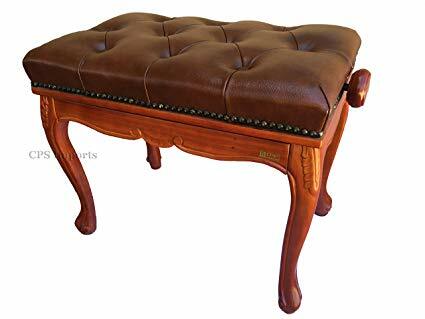 The SONGMICS padded wooden antique piano stool is a great choice for those who do not want to spend a fortune on a piano stool but want something that still looks elegant in their living rooms. Priced at $43.99, this purchase gives you a lot of bang for your buck. It has a bench top with strong, faux leather cushions. 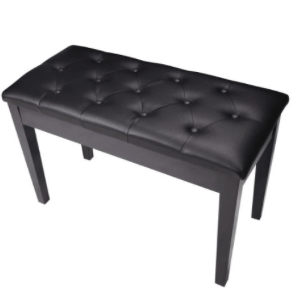 The glossy black /solid wood bench holds up to 300lb and is very sturdy while sitting at the piano. There are also rubber pads on the legs to protect your floors. 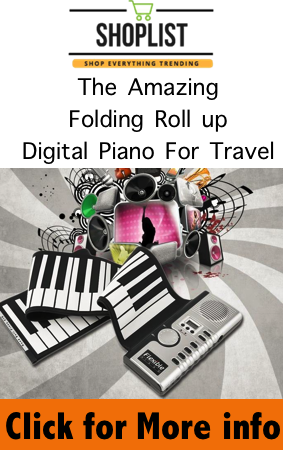 The compartment is easy to open and allows you to have lots of sheet music at hand. The manufacturer claims that assembly is easy as well –which is a huge plus when a new piece of furniture arrives in your home. Priced at just under $60, this antique piano stool is a big favorite on Amazon with customers. Given its sturdy nature, low price, and great design, it is easy to see why. It is smooth and black with a faux leather cushioned seat. As mentioned previously, this is faux leather so it will not look as elegant in your home. (Although it will be better on your wallet.) The height is adjustable from 17.7 – 21.7 inches and the stool can hold up to 330lbs of weight. The anti-slip foot pads are a nice touch as you can feel secure while sitting at your piano playing music. The downside of this bench versus others, of course, is that the leather is “faux” as opposed to genuine. While the average person might not immediately notice the difference when they walk into your home, upon closer inspection it will be clear that this is not real leather. There is plenty of storage underneath the seat, which is aided by a silent lifting mechanism with two knobs. The large cushion is incredibly comfortable because it is constructed with a thick cushion but has no buttons. The color is a mix of polished black ebony and a lovely Charcoal Black — it will match any piano and any decor in your home. The dimensions of the bench are 30 in. Long, 14 in. Wide, and 19in. High — which should result in a comfortable setup for most people playing the piano. Overall, whatever stool you end up selecting, a piano is a huge investment and you should not settle on quality / what you want when you choose your companion seating. It is a great idea to do as much research as possible before buying an antique piano stool online as this will be a piece of furniture you utilize often. In the end, it is up to you to make the choice of what matters most to you in terms of aesthetics, accessories, and storage features. The items on this list are what we feel are some of the best options currently on the market today, but be sure to do your due diligence whenever making a significant purchase such as an antique piano stool.